The blend of antioxidants, cell-communicating peptides, and skin-repairing ingredients makes this an anti-aging powerhouse that beautifully compliments the rest of your skincare routine! This product is 100% fragrance- and colorant-free. Use twice daily after cleansing. Apply to a cotton pad and gently stroke over face and neck. Do not rinse. Follow with a Paula’s Choice exfoliant, serum, moisturizer, and/or treatment product. During the day, finish with a Paula’s Choice moisturizer with sunscreen. Water, Glycerin, Ethoxydiglycol, Niacinamide, Resveratrol, Sodium Hyaluronate, Palmitoyl Tetrapeptide-7, Palmitoyl Tripeptide-1, Phospholipids, Acetyl, Epigallocatechin Gallate, Carnosine, Genistein, Glycyrrhiza Glabra (Licorice) Root Extract, Adenosine, Salix Nigra (Willow) Bark Extract, Xanthan Gum (thickener), Citric Acid (pH adjuster), Polysorbate 20, Butylene Glycol, Ethylhexylglycerin, Carbomer, Tetrasodium EDTA, Phenoxyethanol. 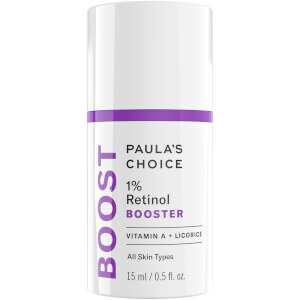 I am a long timer with Paula's Choice products. I appreciate their attention to ingredients and providing great products at reasonable prices. My skin care routine includes PC cleanser, toner, exfoliants and moisturizers - love them all!